If you could start saving 25% of your maintenance costs right now, don’t you think you’d implement a change to make that happen? Well, look no further, because I have a solution for you to reduce your wasteful spending around your aircraft maintenance planning initiatives. Obviously, urgent shipments come up from time to time and it’s not possible to consolidate in these situations. However, for everything else, consolidating your shipments is by far the most cost-effective solution. By consolidating all outgoing repair management contracts and aircraft check projects, we’ve been able to gain control of what could be an out-of-control cost expenditure. Generally, forwarders and express couriers will dictate your costs. However, if you’re upfront with them about how frequently you will be sending to a specific location, you have the ability to negotiate your costs with them and fish for a volume discount. We’ve done this with multiple freight companies. Most recently, we worked with FedEx by providing our running averages for various, but specific, locations and they were able to extend an express rate discount over 5%! That adds up pretty quickly. "THE NO HASSLE GUIDE TO MAINTENANCE CHECK MATERIAL PLANNING"
Streamline your aircraft material needs, reduce lead times, increase aircraft maintenance turnaround times & enjoy a less stressful project. A box is a box and bubble wrap or popcorn filling does the job no matter where it came from. Set up a small area on the shipping flow to establish a reuse system. This will save time AND money instead of having to continually buy new materials. 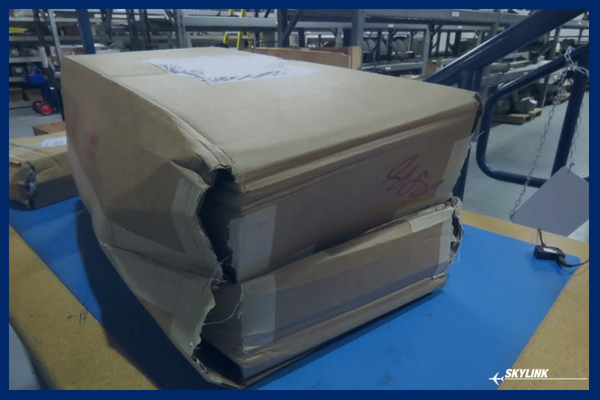 However, we’ve run into issues with companies that have used damaged boxes. We once had a company use a box drenched in Skydrol. By the time the shipment arrived, the box was crumbling and the part was practically falling out. Reusing boxes is a great way to save money, but NEVER at the expense of protecting the shipment! Utilizing an aircraft maintenance partner can be incredibly valuable in reducing shipping costs. Since this is something they do every day, they have pre-established discounts that become available to you through your partnership. You should never feel bad for taking advantage of these discounts. Simply express to your partner that you want them to manage the logistics to and from your facility. Chances are, they'll more than kindly accept. Again, since this is their area of expertise, they’ll be well aware of the first three steps in this list to help fulfill your cost saving initiatives. Since shipping is such a vital area for your business, you should be analyzing your logistics strategy and continually making updates to best meet your needs, both financially and for the sake of time. Shipping is a necessity, which means you must be using partners that you can trust and will always be striving to reduce your freight expenditure.